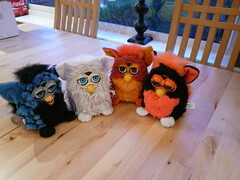 Just got 3 more furbies off of eBay!! I lost out on 2 but I won 2. Three more to go – exciting stuff eh! There’s some furbies for sale on eBay and I’m currently bidding for 7. Keep everything crossed! With the help of the circuit diagram and the stripped furby, I think I’ve managed to isolate the wires to the ir sensors which are on the larger block on the left in the photo below. The wires from the speaker are a bit harder coz they’re red, orange, black and brown so they could be in the same block or the one on the right….or even in a smaller block on the other side of the furby. As this is my broken one, I can’t just pull the blocks out and see what happens. I NEED more furbies!! 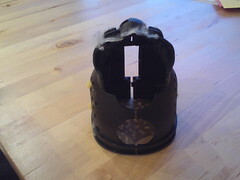 Finally managed to skin a furby and you can see the results below. 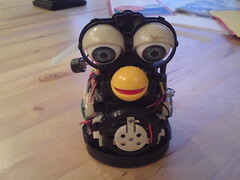 The blurred close up is of the infra-red sensors in the forehead of the furby. One transmits and the other receives, once I’ve isolated them and worked out how the speech is generated then I should be loads closer to having my network up and running. During my research, I unearthed a furby circuit diagram which I’ve been studying. 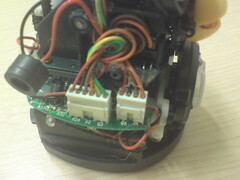 I think I’ve managed to workout which are the sensors and I’ve been tracing them to other parts of the circuit. Now I just have to workout what they are on the furby itself! A Furby is an electronic toy made by Tiger Electronics. 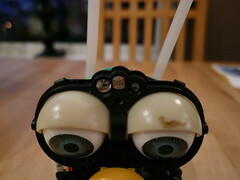 A newly purchased Furby starts out speaking entirely Furbish, the unique language that all Furbys use, but are programmed to speak less Furbish as they learn more English. A Furby has various switches built in that detect if it is being stroked, patted or inverted. 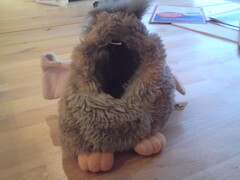 As well as a speaker in its belly there is also a small microphone which is how the Furby “hears”. Research suggests that it is unclear as to what sounds a Furby responds to other than generic loud noises. 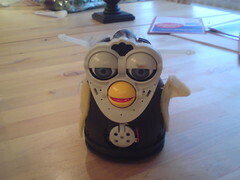 Built into its forehead is an infra-red sensor which transmits and receives data to and from other Furbies and it is via this that a Furby really communicates. Various hacks have been made to Furbies from simple circuit bending to a complete replacement of the microprocessor. Most of them concentrate on the circuitry but I intend to make use of the IR sensor. By connecting two Furbies to a computer each, I want to make a small wireless network by sending data via the IR sensors. Keeping the main circuitry intact, I want to create the illusion that the Furbies are passing the data by “talking” to each other.